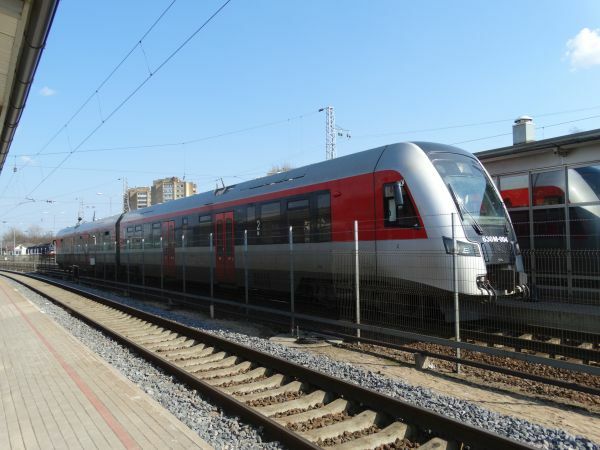 The class 630M is one of the newest trains in Lithuania. 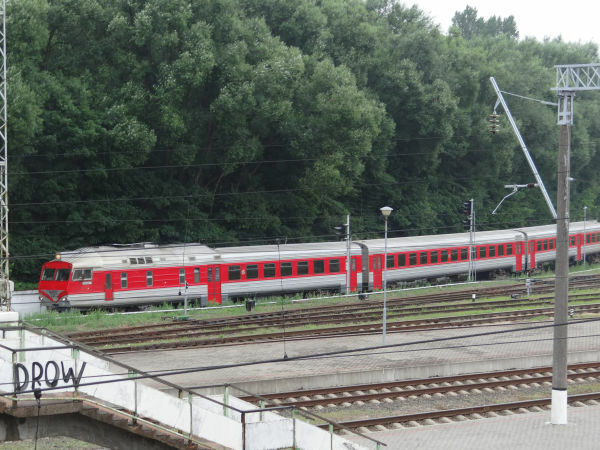 It is a two coach diesel railbus made by the Polish company Pesa. 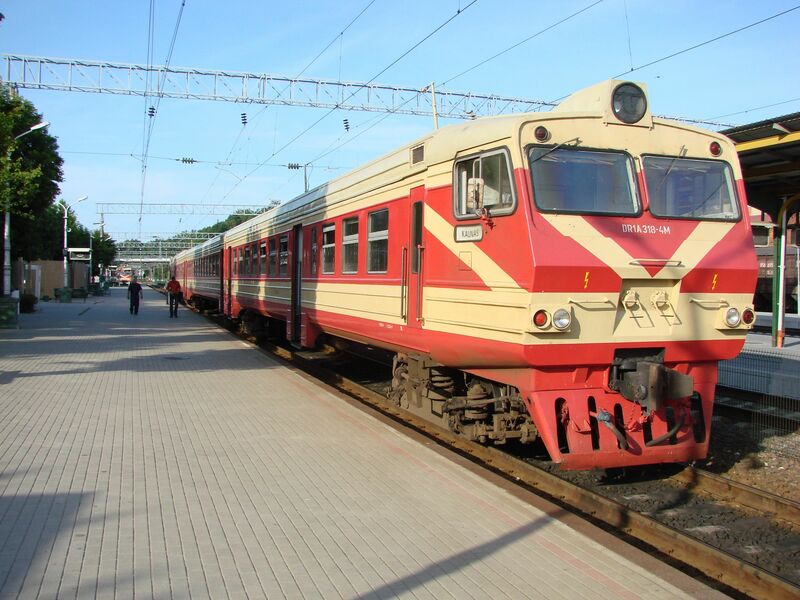 It is based on the earlier one coach railbus 620M, shown on our front page of Lithuania and also below. 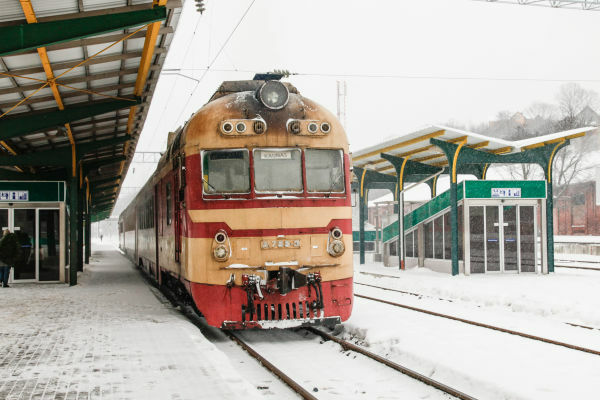 They are now used by the state railways of Lithuania, Kazachstan and Ukraine. 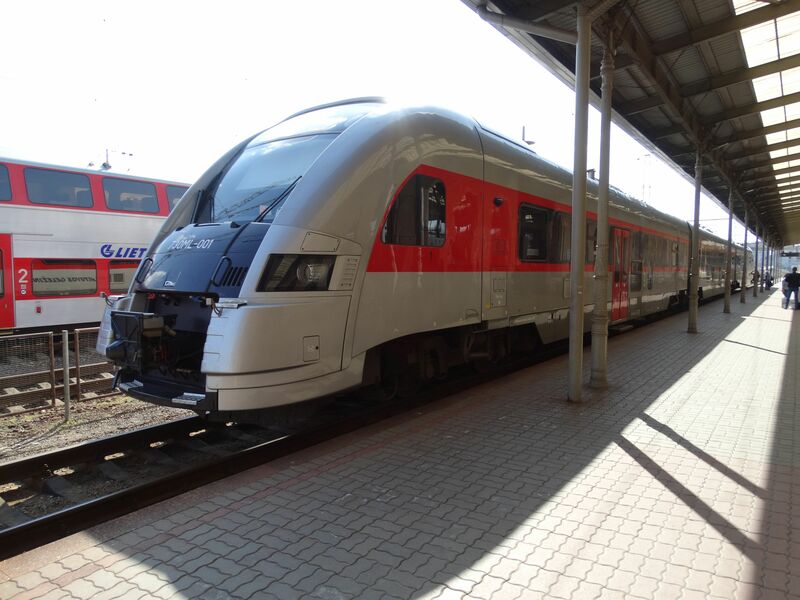 Lithuanian state railways LG now has (only) three of these trains. Picture from Vilnius 2.4.2017 by Ilkka Siissalo. The class 620M is now LG's new solution for lines with only a few passengers. These one coach railbuses are made by Pesa in Poland. Picture of a class 620M railbus ready to leave towards Marijampole is from Kaunas 28.6.2013 by Ilkka Siissalo. 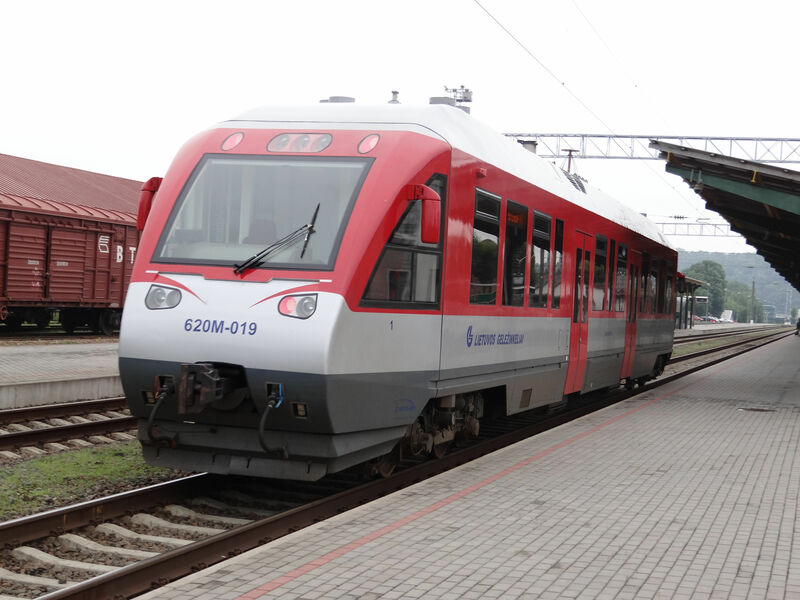 Another view of the one coach railbus 620M which is also shown on our front page of Lithuania. This is a product from the Polish company Pesa. 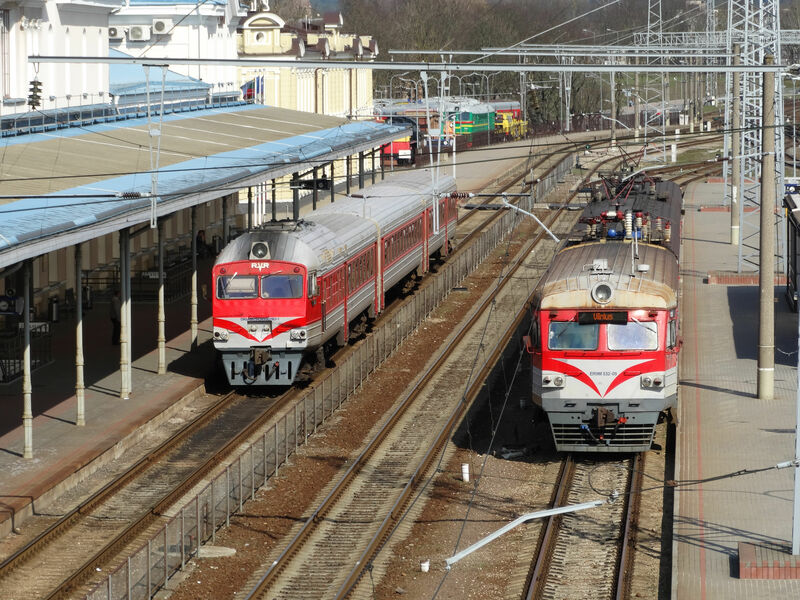 They were produced 2004-2013 and Lithuanian railways uses them especially in the western regions on lines with very little traffic. This one is on service between the city of Vilnius and the local airport. Picture from Vilnius 2.4.2017 by Ilkka Siissalo. On the right two of the very newest Lithuanian diesel multiple units of the class 730ML. 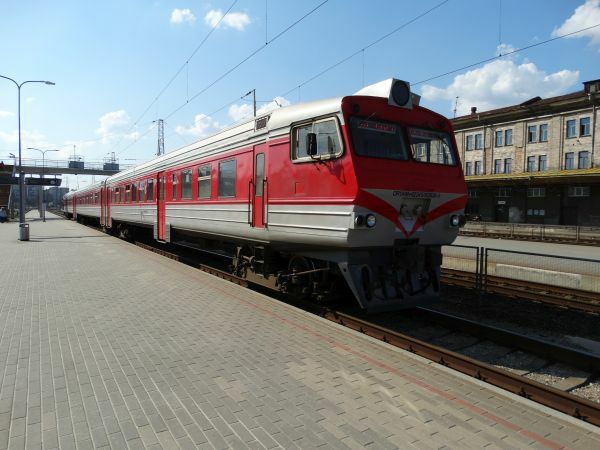 These are built by Pesa of Poland and entered service during summer 2016. 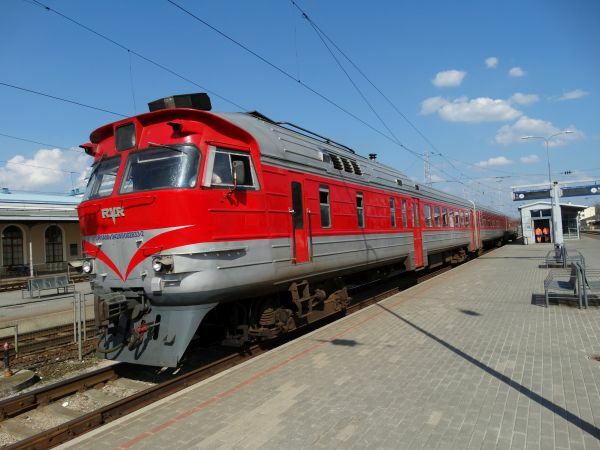 Lithuanian state railways LG has six of them and uses them on the Vilnius - Klaipeda route. 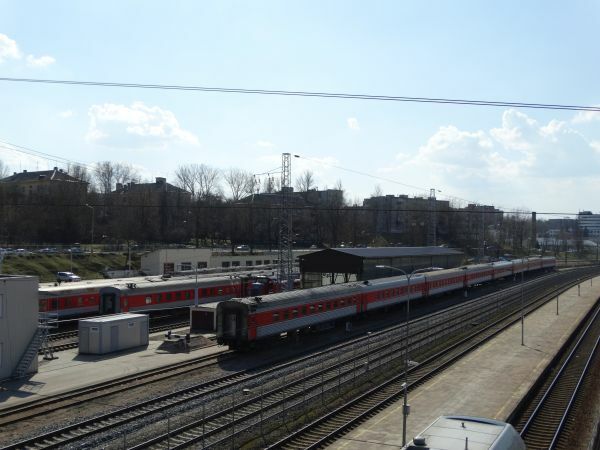 To the left of the very new ones there are two of the Soviet time DR1A units (red and silver head) and still to the left of them are class DP3 units of Belorussian railways (green front). 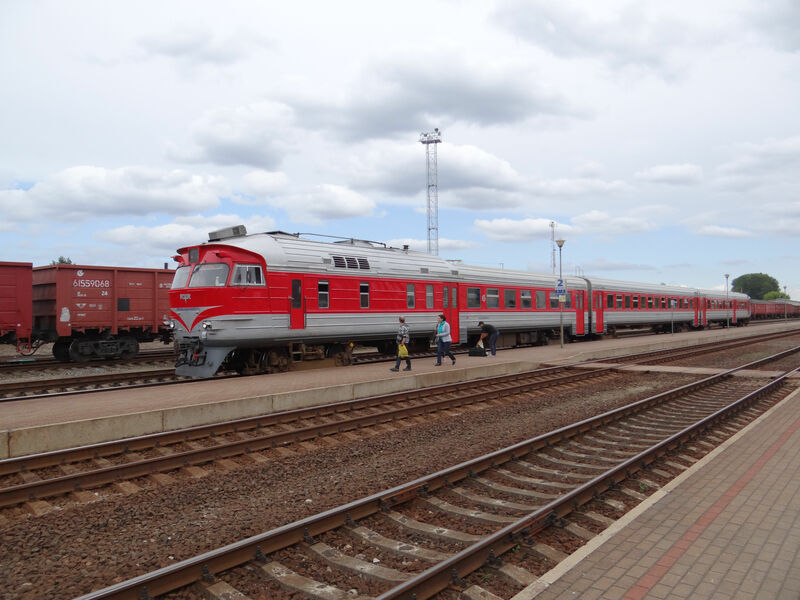 The Belorussian DP3 and the Lithuanian 730ML are essentially the same trains. Picture from Vilnius 2.4.2017 by Ilkka Siissalo. Side view of the new class 730ML train. Picture from Vilnius 2.4.2017 by Ilkka Siissalo. The brand new 730ML no. 001 has just arrived to Vilnius from Klaipeda and people have just stepped out. This was an InterCity service. Picture from Vilnius 2.4.2017 by Ilkka Siissalo. This is an old socialist time diesel multiple unit of the class DR1A, built originally by RVR in Riga in the 1960s, but several times modernised. It is now called class DR1AMv where M stands for modernised and v stands for new transmission from the company Voith. Picture from Vilnius 2.4.2017 by Ilkka Siissalo. The other end of the same DR1AMv train. Picture from Vilnius 2.4.2017 by Ilkka Siissalo. A DR1AMv unit has just stopped at Jonava station en route to Vilnius. Picture in Jonava 26.6.2015 by Ilkka Siissalo. Normally all DR1 and DR1A units have one round and bulky head just like in the pictures above and then one end with more edgy drivers' cabs. 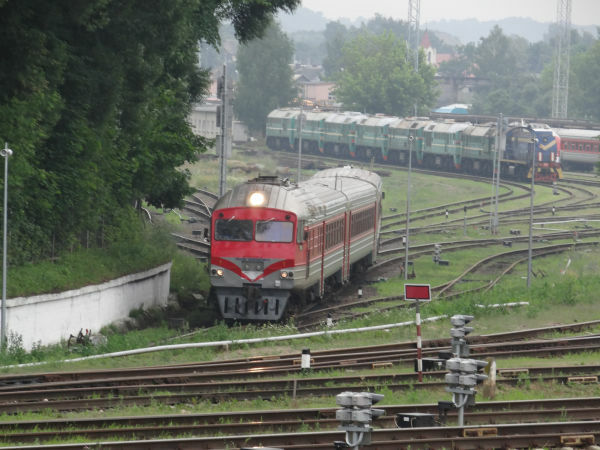 But in Lithuania there are also trains like this, shown on the left, with an edgy cab at the bulky end. Compare the train at the left with the two pictures above. All are of the class DR1AMv. 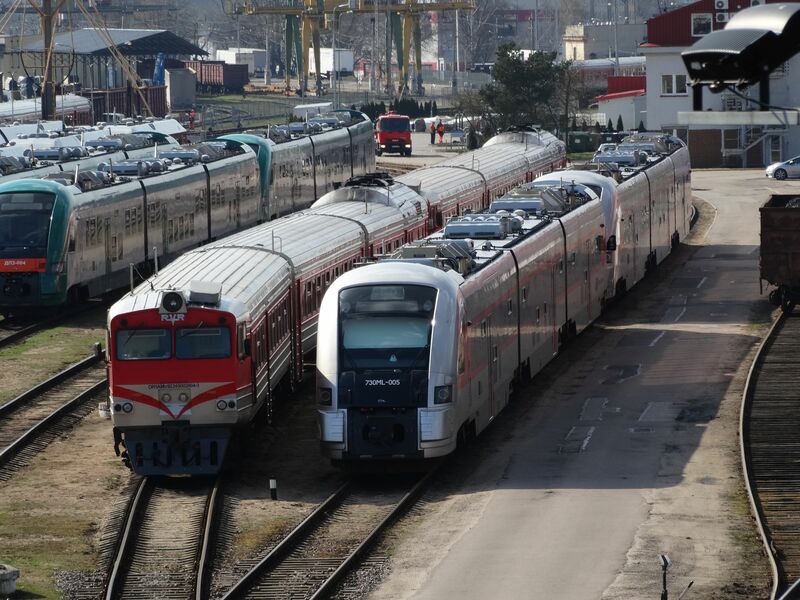 On the right in the picture is a class ER9M electric multiple unit. Picture at Vilnius station 2.4.2017 by Ilkka Siissalo. Another "flat face", edgy drivers' cab front end DR1AMv. 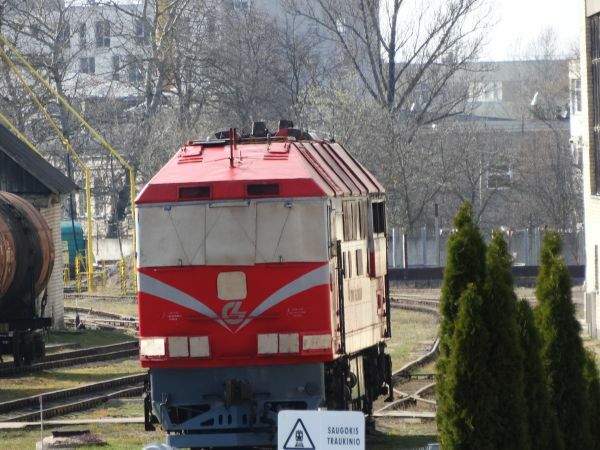 In the background a long line of scrapped old green M62 locomotives in the typical green USSR colours and one TEM2 shunter also in the typical blue USSR paintings. Pure 1960s Soviet style. Picture in Kaunas 28.6.2013 by Ilkka Siissalo. The same "flat face" DR1AMv as above, but seen from the side. Picture in Kaunas 28.6.2013 by Ilkka Siissalo. This is how one of the same DR1A "flat face" trains looked like before any modernisations ten years earlier. Picture of a DR1A in Kaunas 4.7.2007 by Ilkka Siissalo. Same train as in the picture above, but seen a bit more from the side. Picture of a DR1A in Kaunas 4.7.2007 by Ilkka Siissalo. 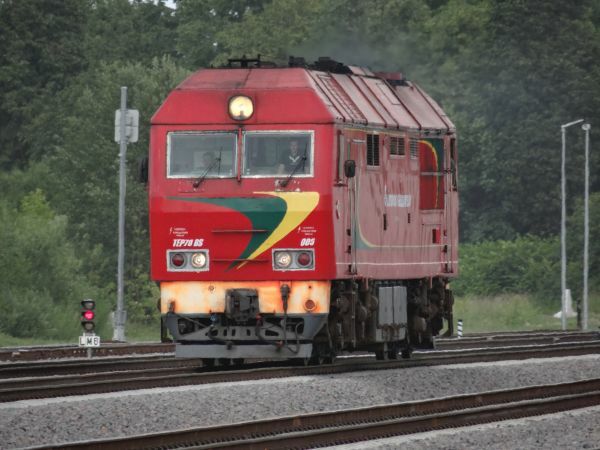 Still the same train as in the two pictures above, but seen from the other end.. Picture of a DR1A in Kaunas 4.7.2007 by Ilkka Siissalo. Sometimes TEP70 locomotives are used as pairs in the same way like two old M62 locomotives with just one driver's cab each to form a 2M62 double unit. This is one half of a "2TEP70" double unit. The extra cab has not been removed, but just covered. Picture from Vilnius depot 2.4.2017 by Ilkka Siissalo. 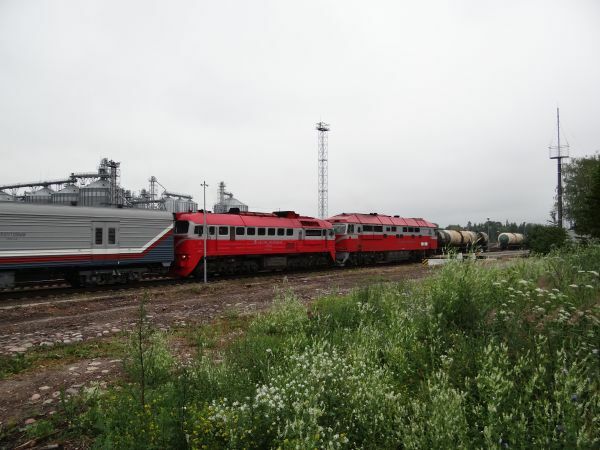 There is heavy train traffic connecting the Russian isolated enclave of Kaliningrad (ex. German Königsberg / East Prussia) with mainland Russia. 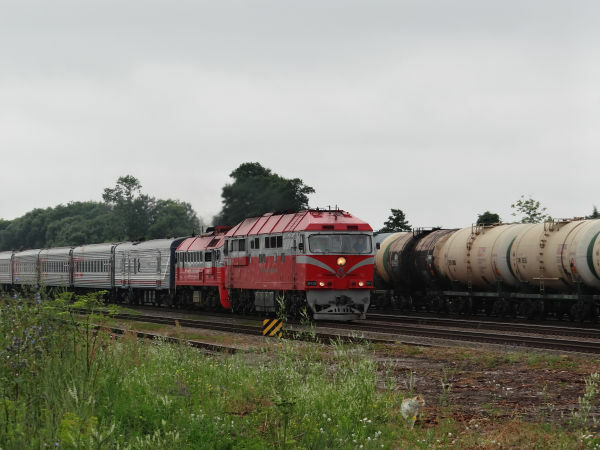 This is a very typical long Russian express train coming from Kaliningrad and running here through Lithuanian territory with Lithuanian locomotives towards the east and Russia. The first locomotive is a TEP70 and the second one is an older M62. Picture at Mauručiai station 28.6.2013 by Ilkka Siissalo. Same Russian train as in the picture above, in full speed running from Kaliningrad east to Russia. The first locomotive is a TEP70 and the second one a remotorised M62 now classed as M62K. Picture at Mauručiai station 28.6.2013 by Ilkka Siissalo. 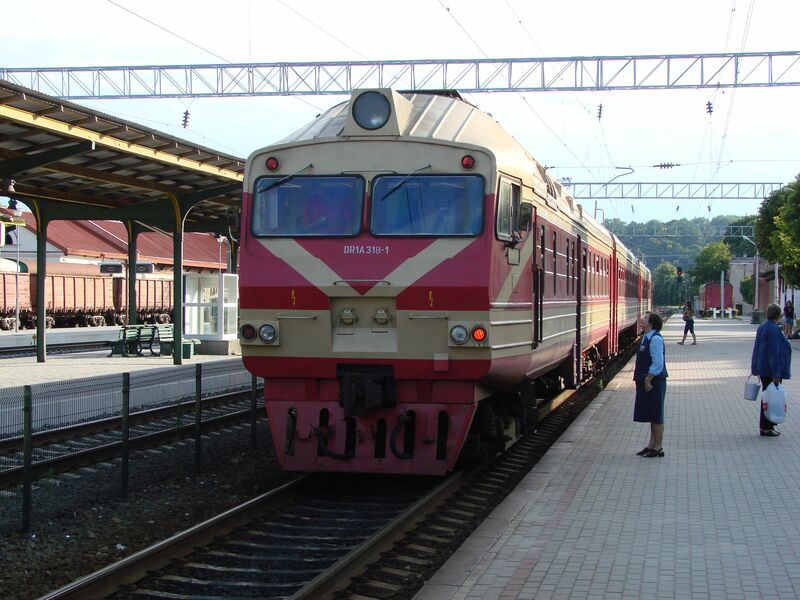 A class TEP70BS passenger train locomotive. These huge machines are used especially with the long distance trains from Lithuania towards the east, to Russia and Belarus. This is a modern version of the 1970s Russian type TEP70, built by the Kolomna works in Russia. LG has four of them and they were built in 2006. Picture from Vilnius 2.4.2017 by Ilkka Siissalo. Another TEP70BS approaching Mauručiai station 26.6.2015. Picture by Ilkka Siissalo. Still the same TEP70BS in Mauručiai as in the picture above 26.6.2015. Picture by Ilkka Siissalo. 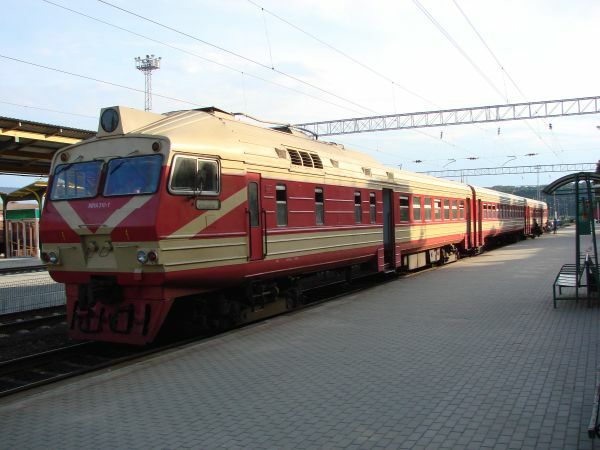 Traditional long distance train passenger coaches such as these ones are normally used in Lithuania in trains between Lithuania and Russia. Typically these are pulled by TEP70 locomotives. In the picture behind the first line of coaches can also partly be seen the TEM-LTH switcher locomotive, a prototype locomotive of which only one exists. 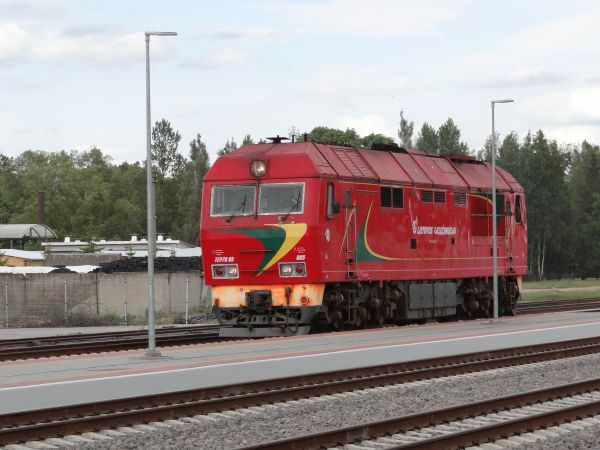 See category Lithuania -> cargo trains and locomotives for more info of this rarity. Picture from Vilnius 2.4.2017 by Ilkka Siissalo. This is the TEP60, built by Kolomna factories in Russia in the 1960s since 1960. They were used in passenger express trains, especially in front of the trains between Lithuania and Russia or Lithuania and Belorussia until 2011 when the last ones were retired. This one has even gotten the new LG red and white painting, but typically they were always in the reddish brown paintings that they had during Soviet times. 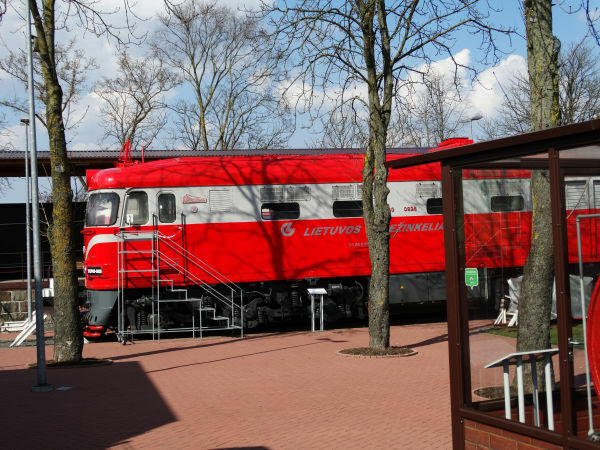 See the category Latvia -> railway museum in Riga for more pictures. Picture from the railway museum by the station of Vilnius 2.4.2017 by Ilkka Siissalo. This is something that you will not be able to see in Lithuania or any other place in the Baltics anymore, except maybe in a railway museum in Kaunas. This is a four coach diesel multiple unit of the old class D1, built by Ganz Works in Budapest, Hungary in 1963. 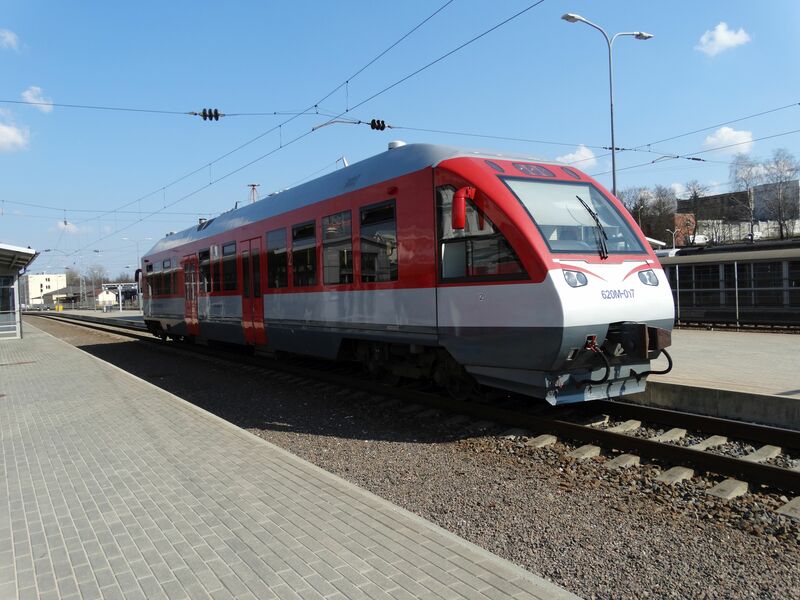 Lithuanian state railways Lietuvos Gelezinkeliai LG used to have 24 of them. 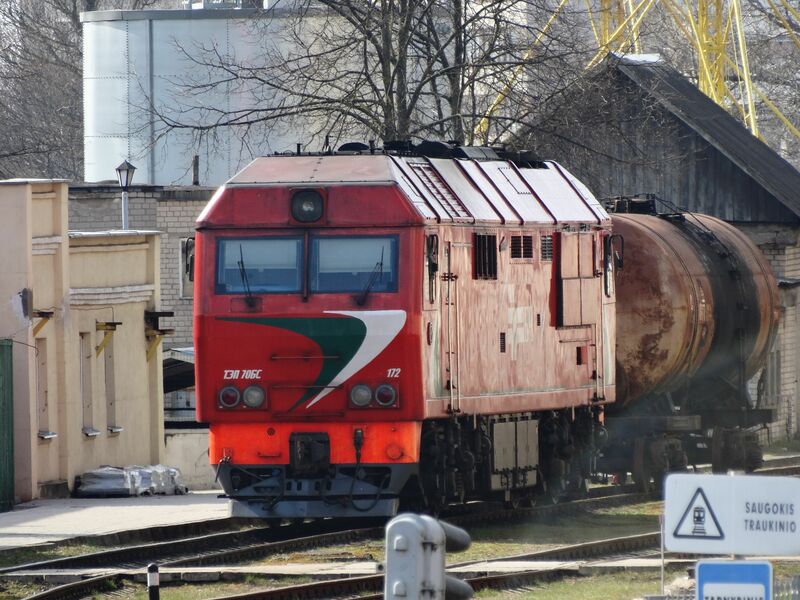 Here it is seen arriving in Kaunas 29.12.2010. Picture by Kyösti Isosaari.